City of Alpharetta, Georgia honors ZCorum with special recognition at 2017 Business of Excellence Event. Alpharetta, GA – April 10, 2017 — ZCorum, an industry leader in the deployment of managed diagnostics tools and software for broadband providers, announced that the City of Alpharetta, Georgia has named ZCorum as a Business of Excellence for the fifth year in a row at the city’s annual Business of Excellence Awards Presentation. The event, which is sponsored by the City of Alpharetta and Mayor David Belle Isle, honors an elite group of businesses in the city that have distinguished themselves by winning an award in the previous year from local or national organizations. This year the event included a special introduction and recognition of the businesses that have achieved the Business of Excellence designation for five consecutive years. The city awarded ZCorum a large plaque and a limited edition Five Year Coin to commemorate the occasion. 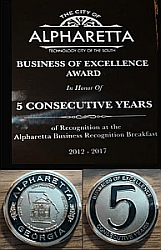 The annual ceremony in March recognizes successful Alpharetta companies with a “Businesses of Excellence” distinction to show the City of Alpharetta’s appreciation for leaders in their respective industries who are going above and beyond business as usual. The event was attended by local businesses, the Mayor and other City representatives. During his keynote, Mayor Belle Isle congratulated the five year winners and encouraged everyone to continue the “excellence” that is leading Alpharetta into the future.